I needed to be at the front of the train at Emmerich to check which 101 had worked forward from Mannheim; it was during my walk to the front of the train that I began to wonder if it was the train loco or something else that shunted the Amsterdam portion from CNL478 to CNL418 at Mannheim? Having been on it two nights running at that point….. I found 101026 at the head of the train and it was replaced by NS 1732, which had already been waiting in the headshunt to back on as we arrived. 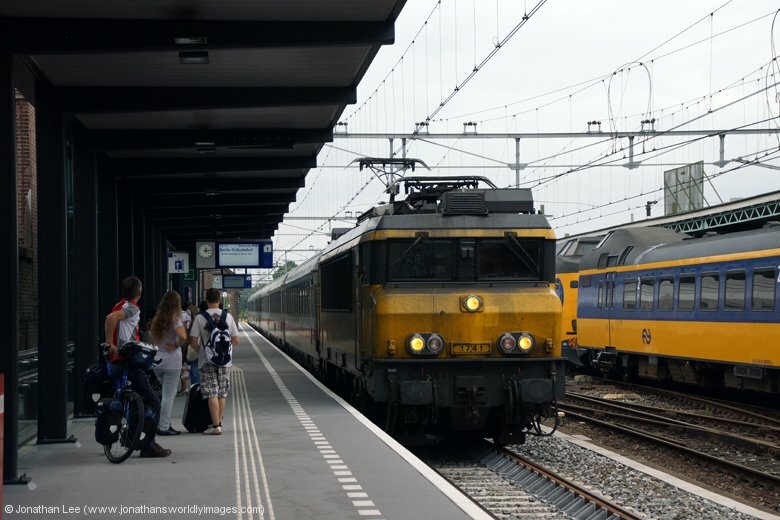 Unfortunately though we were 20 late away from Emmerich and I missed the plus 7 at Arnhem onto the 0649 Zwolle – Roosendaal and had to wait for the next one 30 minutes behind; this unfortunately meant I’d miss out on two of the 1700 turns on the Zwolle – Roosendaal circuit that day, or not as it turned out……. 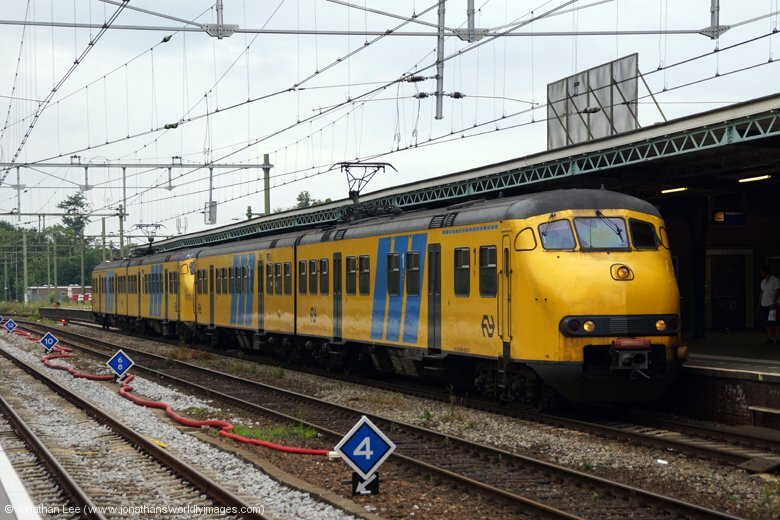 My first move was a pair of EMU’s on the 0719 Zwolle – Roosendaal, which as it happened was a booked unit turn, but I needed to get to Nijmegen so I could spin whatever was thrown at me on the rest of the turns between there and Elst; plus 5’s and 6’s at either end with Nijmegen Lent in between if needed. I have to say the 4xxx series EMU’s really do look bizarre with their high level cab that can only be described as a bulkhead, looking similar to that of a ship that has opening doors to allow vehicles on board! Nijmegen station is quite nice and has a buffet on the platforms that the Zwolle – Roosendaal trains depart from, it being a cross platform leap from one to the other in either direction so I didn’t have to walk far. 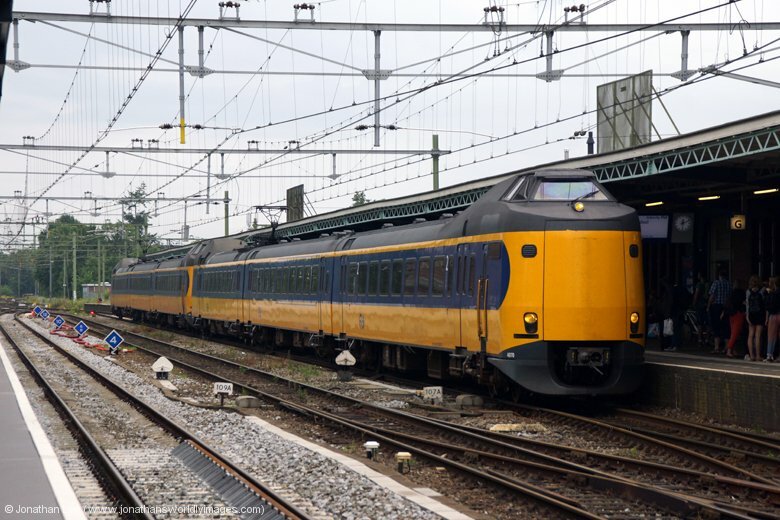 Thankfully 1745 turned up on IC3624 0720 Roosendaal – Zwolle as I was fearing the worst after passing a single 4xxx series EMU with the previous Roosendaal – Zwolle. 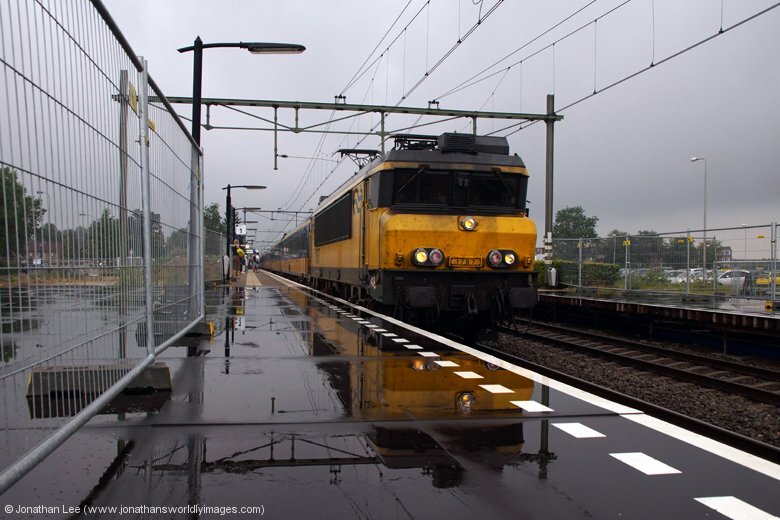 Despite the heavy rain that had bestowed Holland with its presence that morning I still got a photo of 1745 departing Elst as it pushed the train towards its destination. Elst is a station that has a road level crossing right at the end of the platforms and if a tight plus it could be one of those moves that ends in tears; however while the barriers remained down after 1745 departed it wasn’t for my southbound train and the moment they began to lift I rushed underneath as they were lifting to get to the shelter at the other side and out of the pouring rain. While running up the ramp at the other side I was stopped in my tracks by some guy that wouldn’t get out of my way, who then produced a badge to confirm he was security and announced that I’d just done something that was illegal! 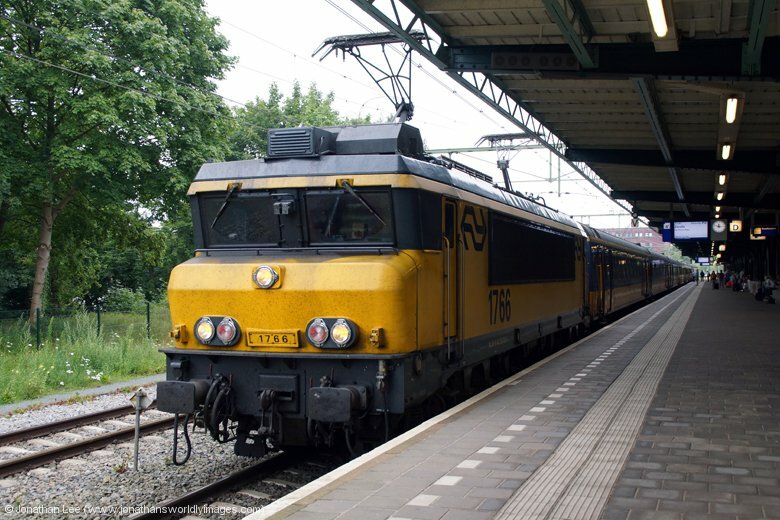 When I questioned if it was the photos I’d just taken of 1745 departing he replied with a “no” and announced that I’d disobeyed a red stop signal when I ran under the barriers; which in Holland comes with a 65 Euro fine! When he realised I was English he became a little more lenient in the fact that he explained the law and my punishment on this occasion would be missing the train to Nijmegen that I’d been running for. 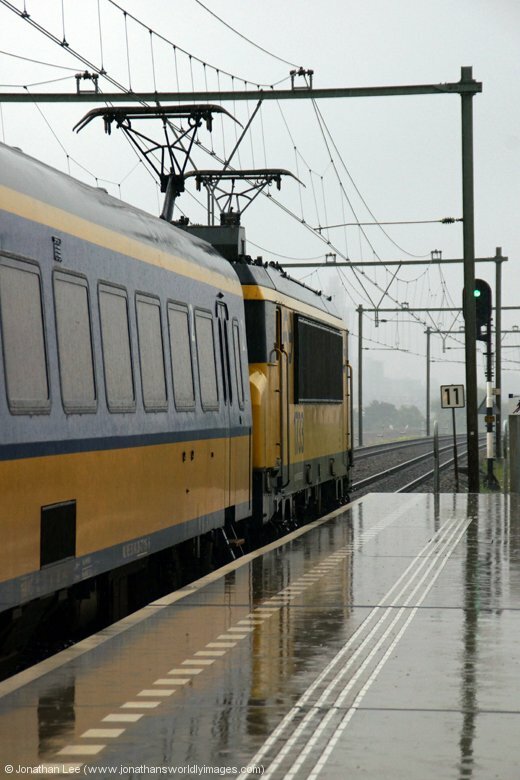 Of course he didn’t realise that I’d been running to keep dry and not to catch the train he’d made me miss and 1738 arrived moments after he let me go with IC3629 0749 Zwolle – Roosendaal. 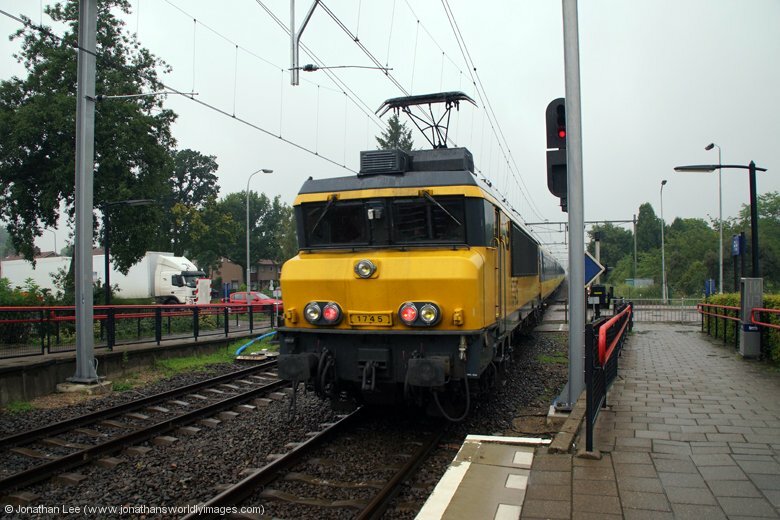 Once I returned to Elst on the next northbound Zwolle, with 4014/4231 vice 1700, I watched folk at the barriers before crossing and sure enough everyone waited for the barriers to lift fully and the red lights to stop flashing before crossing; as did I from that point on! 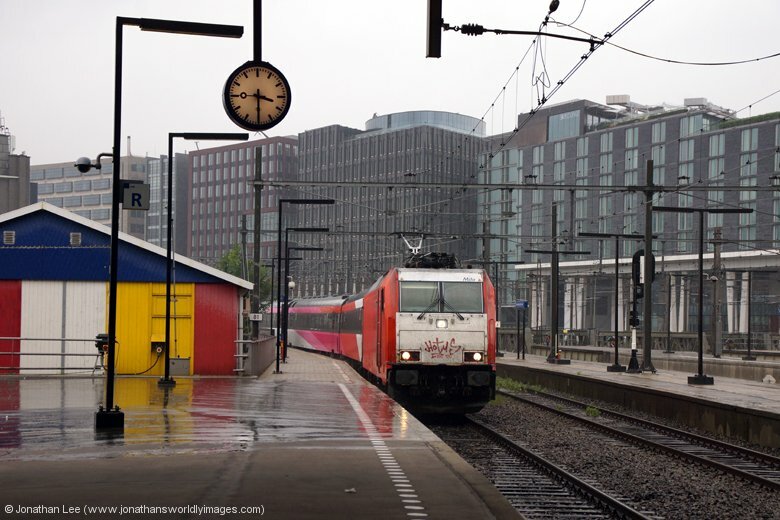 The next southbound trip from Elst was delayed due to another train ahead being stopped in the next signal section as a result I ended up getting off at the fall-back shack of Nijmegen Lent; not a shack for quick leaps from one platform to the other I might add. That set the scene for the rest of my moves on the Zwolle – Roosendaal trains due to lateness and I never saw Nijmegen again. The next 6 moves throwing up 8741 on a booked EMU turn and then two pairs of 4xxx units vice 1700s which ultimately meant there were 5 of the 1700 booked turns being covered by EMU sets that day, the last of which I saw at Deventer after I’d arrived which meant the two moves I’d missed due to CNL418 being late hadn’t mattered at all as both were EMU’s! 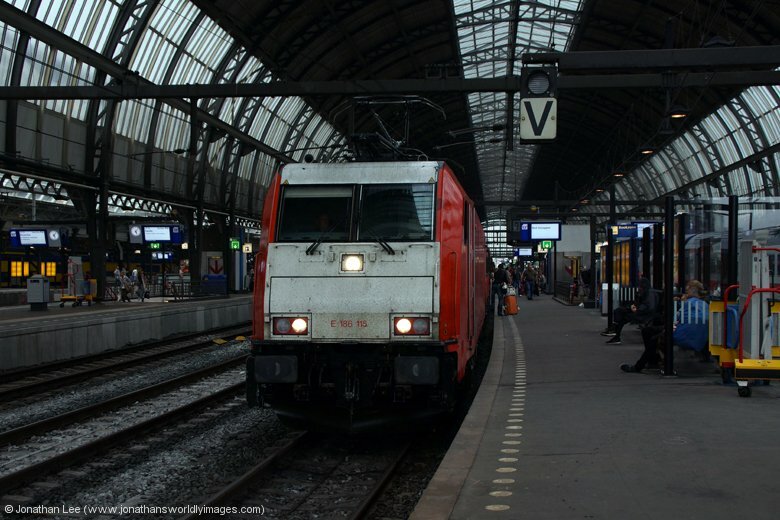 Having purchased some food at Deventer I watched 1730 depart with IC240 0625 Berlin – Amsterdam about 15 late. 1741 then arrived shortly afterwards with IC145 1101 Amsterdam – Berlin. On board I was well and truly told by the gripper for not having filled out the cover of my Inter Rail pass, which I’d in fact removed as it’s just a farce anyway. As I then red the rules en-route to Almelo I found that the pass wasn’t actually valid if the cover was removed!!! That was as well as not having my details filed in or the journey added to the sheet either. The gripper not being content with the fact that I’d already done way more journeys than would actually fit on the sheet anyway and wouldn’t accept my moves book as proof of all the journeys; telling me I needed to go to a booking office anywhere in Europe to get an extra sheet to fill in, which isn’t what the Inter Rail pass rules tell you; any piece of paper will actually suffice! Eventually she left me filling out my personal details on the pass, which I didn’t manage to finish before Almelo as she’d spent so long jabbering at me. The two hour journey that IC148 0825 Berlin – Amsterdam offered, all the way into Amsterdam, was again a welcome one; with 1731 at the helm. 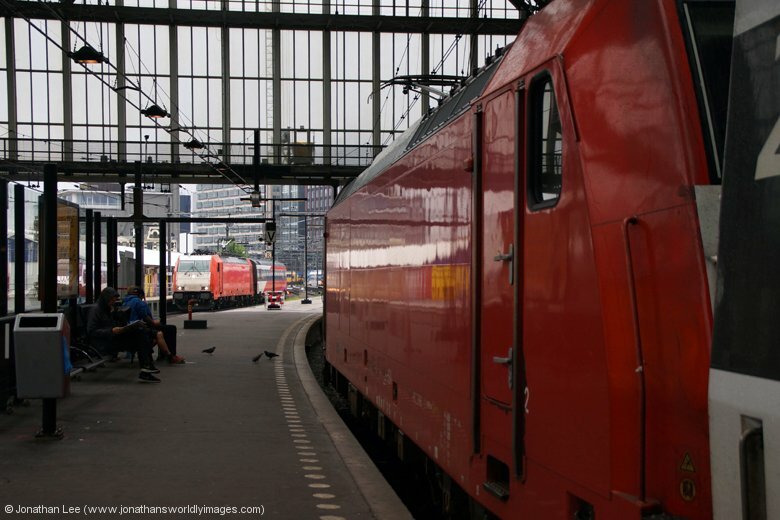 The plus 1 onto the next IC towards Germany made with 1730 waiting to depart with IC149 1501 Amsterdam – Berlin. It should have done the 1701 by diagram but had been stepped up; ultimately 1731 then did the 1701 as opposed to being finished for the day by diagram. I didn’t bother rushing for 1730 as my afternoon was planned out doing 186’s on the Amsterdam – Breda circuit. The first of which was showing on the screens as being 15 late, which would bugger the first move to Schiphol up as it was only a plus 12! Thankfully 186120 was in the platform at 1533 for the 1525 to Breda and we only departed 10 late but thanks to a bit of slow running I had a quick dash over the bridge to make 186117 heading back into Amsterdam with 939 1457 Breda – Amsterdam. Yet after that everything was spot on time for the rest of the afternoon/evening but after the next return trip to Schiphol the move went in the bin as I found 1056 1710 Amsterdam – Rotterdam cancelled so I ended up flagging the 1725 Breda as it was dud and doing the 1755 Breda to Schiphol where I found a decent pizza place upstairs on the airport concourse for food before returning to Amsterdam on the 1757 Breda – Amsterdam. 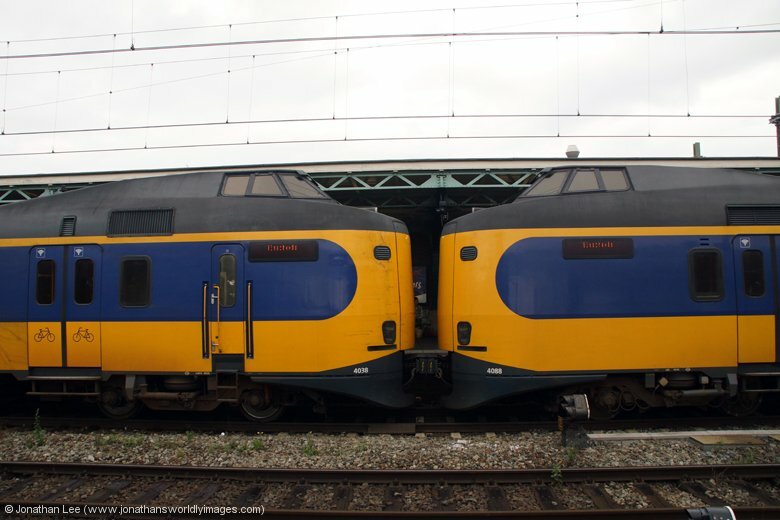 The inbound evening Rotterdam – Amsterdam, 1053 1838 Rotterdam – Amsterdam, was also caped for some reason; both turned being booked for different engines according to the diagrams so maybe one had been caped due to issues and the other to balance up sets? 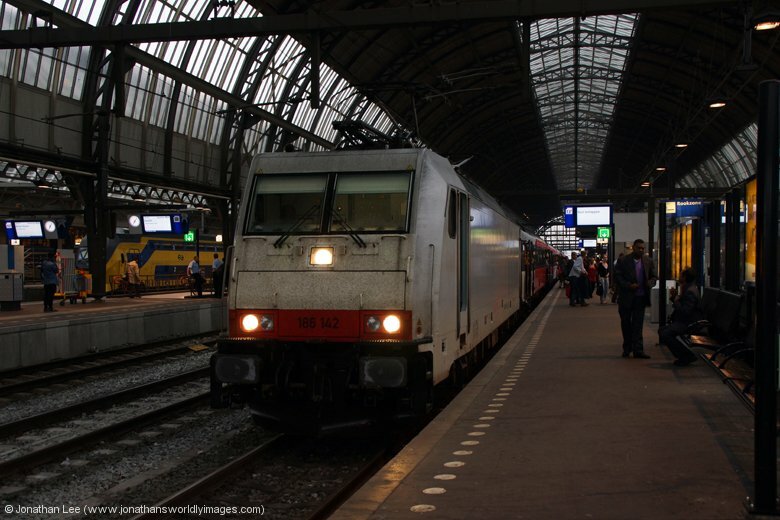 With a fourth return trip to Schiphol on offer it would have been rude not to; especially after the relative disaster that had been the Zwolle – Roosendaal trains. And with a plus 25 back at Amsterdam I had enough time for supplies from Burger King and Starbucks before joining the Zurich portion of CNL419 2031 Amsterdam – Munich for a mirror move back to Mannheim with 1732 to Emmerich, where DB 101026, that had been waiting since being removed from CNL418 that morning, replaced the Dutch loco for the run forward to Mannheim. I was again in a three berth sleeper compartment, this time sharing with a couple of Chinese lads. I swapped my middle berth for the upper one so they could be next to each other and once I’d watched the loco change take place at Emmerich I retired upstairs and sleep soon followed. Note 1056 1710 Amsterdam – Rotterdam (Day 4) & 1053 1838 Rotterdam – Amsterdam (Day 7) were both caped.